Directed by Ethan Hawke, BLAZE stars newcomer Ben Dickey as Blaze Foley, the unsung songwriting legend of the Texas outlaw music movement whose unique artistic contributions gave rise to the likes of Merle Haggard and Willie Nelson and inspired both John Prine and Lucinda Williams. Loosely guided by the narrative of Foley cohort and co-conspirator, Townes Van Zandt, played by Bob Dylan band guitarist Charlie Sexton, the film weaves together three different periods of time, conflating Blaze‘s past, present and future in a poignant exploration of his love affair with Sybil Rosen, played by Alia Shawkat. Featuring an ensemble cast of inspired performers, the film explores the uniquely American art of storytelling through renditions of the Blaze Foley songbook, and examines the impact of both his art and his untimely death on his fans, friends, and collaborators. Featuring new recordings of classic Blaze Foley compositions and including a stirring rendition of the Lucinda Williams-penned tribute to Blaze,“Drunken Angel,” performed by Alynda Segarra of Hurray for the Riff Raff, the Blaze: Original Cast Recording serves not only as a tribute to the power of Blaze‘s writing, but a worthy homage to his spirit as evidenced by Ben Dickey‘s contribution of the original song “Blaze & Sybil’s Lullaby,“ composed by Dickey especially for the film and performed alongside co-star Alia Shawkat. Also included in the album’s running order are new versions of some of Foley‘s best-known songs lovingly channeled by Dickey, including “Clay Pigeons,” “Picture Cards,“ and “Big Cheeseburgers and Good French Fries,” as well as tunes by Blind Willie McTell, Roger Miller, and Townes Van Zandt. Rounding out the deluxe gatefold LP package are extensive liner notes, including an essay by writer/director Ethan Hawke and a conversation with Ben Dickey and Foley‘s longtime companion and the film’s co-writer, Sybil Rosen. 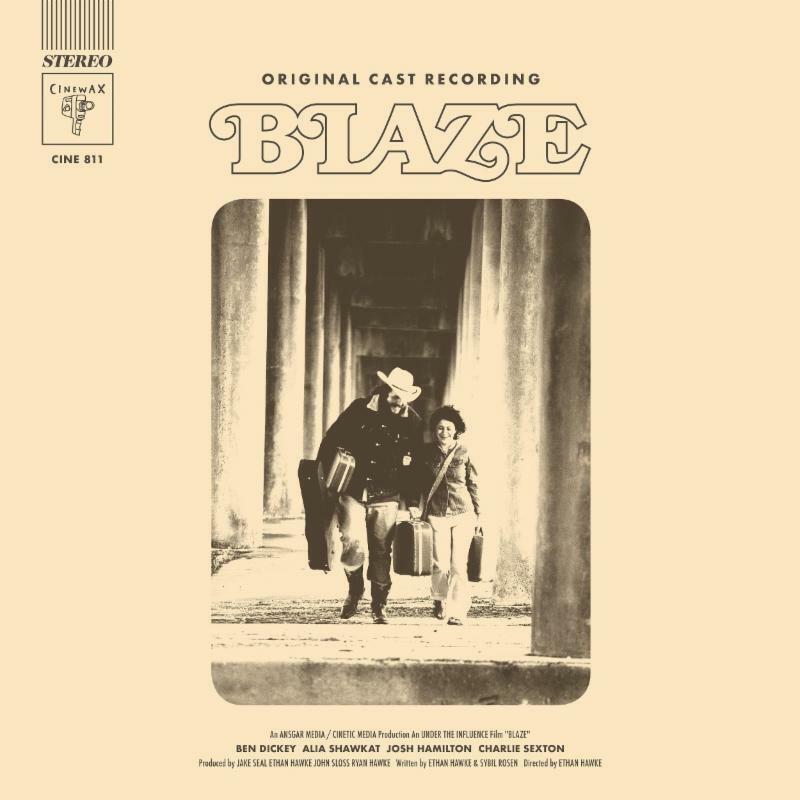 Click here to preorder BLAZE: Original Cast Recording. BLAZEpremiered at the 2018 Sundance Film Festival where Dickey‘s performance won him the Special Jury Award for Achievement in Acting. Dickey stars alongside Alia Shawkat, Charlie Sexton, Josh Hamilton, Richard Linklater, Alynda Segarra, Sam Rockwell, Steve Zahn and Kris Kristofferson. The film was co-written by Ethan Hawke and Sybil Rosenand is based on Rosen‘s memoir Living in the Woods in a Tree: Remembering Blaze Foley. Known for their grassroots success with Rodriguez, the reclusive singer-songwriter whose unlikely story of personal triumph received long-overdue worldwide acclaim in the Academy Award®-winning documentary SEARCHING FOR SUGAR MAN, Light In The Attic Records has gone on to garner nominations for multiple GRAMMY Awards, including one for Best Historical Album (2015) for Native North America (Vol. 1). Their exuberance and dedication to spreading joy through music has propelled them through the release of 200+ titles worldwide, setting the pace for reissue labels and the archival process. From D’Angelo to Donnie & Joe Emerson, Sixto Rodriguez to Serge Gainsbourg, Betty Davis to Karen Dalton, Lewis to Lifetones, the list goes on and on. Light In The Attic is co-owned and operated by co-founders and high school friends Matt Sullivan and Josh Wright. In addition to the label’s acclaimed output, the company also distributes over 75 record labels. In 2010, LITA expanded from their native Seattle by opening offices in Los Angeles,including a successful music house focused on licensing for film, television and advertisements, along with music supervision. Light In The Attic also operates a thriving physical brick and mortar record store in the KEXP Gathering Space in Seattle. For more info, visit LightInTheAttic.net and follow on Facebook, Instagram and Twitter.